I hope you find great value in these Quotes about Death and Dying from my large collection of inspirational quotes and motivational sayings. preparing themselves for dying and death. Momma always said dyin' was a part of life. I sure wish it wasn't. Dying is easy, it's living that scares me to death. A man's dying is more his survivor's affair than his own. Dying is a wild night and a new road. as well as useless, to resist. but dying, which is terrible. If you die you're completely happy and your soul somewhere lives on. I'm not afraid of dying. Total peace after death, becoming someone else is the best hope I've got. He's a very-good looking Death. With him, dying isn't so bad. Openness about death has led to greater care about all aspects of dying. and spiritual practice leading to enlightenment. individual has a vision of a person about whose death he or she did not know. I think we should look forward to death more than we do. but dying is really the only chance we'll get to rest. People are scared to death of dying. I am afraid of death, scared by it. I already don't know whether I exist or not. So dying really terrifies me. Islam is a religion of success. It is not death, but dying, which is terrible. Even very young children need to be informed about dying. Explain the concept of death very carefully to your child. This will make threatening him with it much more effective. We are dying from overthinking. our death brings no pleasure on the world. I'm not afraid of death but I am afraid of dying. but the many terrible ways of dying. it makes all objects appear more lovely to the dying. for we are dying the darkness and we know no death. When you stop doing this activity it is as though you are dying. The death of that activity is a death in itself. A dislike of death is no proof of the want of religion. for no creature can like its own dissolution. for dying to the Christian is the way to life eternal. It was from an old friend who thought he was dying. thank God, so don't treat everything like it's life or death. It hits the worst off people hardest of all. gap which leads to poorer people being ill more often and dying sooner. about people dying all around them, about their own fear of death. and I have, from moving, from traveling. The emotion is real, it just doesn't actually have to do with death. longing for somebody who's disappeared in your life. There is no such thing as an ugly language. it overwhelms me as though it were the death of the earth. There is no death, only a change of worlds. you leave this world behind you. It's what you leave behind you when you go. Courage is being scared to death - but saddling up anyway. will pursue their principles unto death. Nirvana is not the blowing out of the candle. It is the extinguishing of the flame because day is come. and cease only at death. and death of fear is certain. death is but the next great adventure. the longer shall we be immortal. Only love and death will change all things. but the fear of pain or death. but a time to celebrate returning to the Creator. The fear of death follows from the fear of life. A man who lives fully, is prepared to die at any time. Without zest, what is life? We cannot banish dangers, but we can banish fears. We must not demean life by standing in awe of death. if only because it is less boring, and because it has fresh peaches in it. Death is the tyrant of the imagination. Grief is a normal and natural response to loss. It is originally an unlearned feeling process. Keeping grief inside increases your pain. to release balloons in the sky to celebrate that I graduated. For me, death is a graduation. have integrity enough not to fear death. all the burden on your heart disappears. of love - everything disappears. it is only putting out the lamp because the dawn has come. 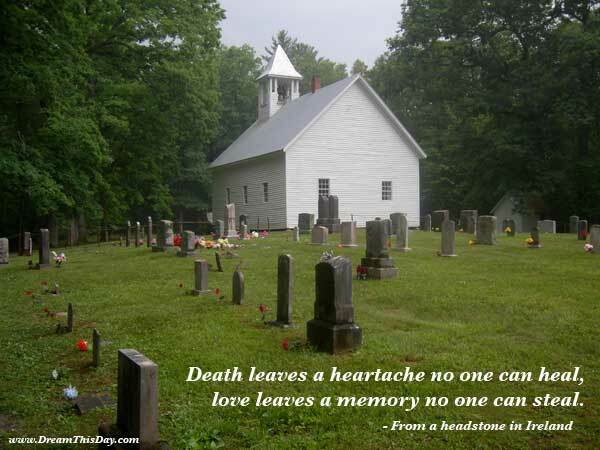 Thank you for visiting: Death and Dying Quotes - Quotes about Death and Dying.